Local Artist - Dancer / Dreamer. Vinyl EP. Bleep. Mood Hut Records have been quietly impressive since launching in 2012. The Vancouver imprint’s ebullient brand of lo-fi house has won them many admirers and scored much-loved releases from the likes of Pender Street Steppers and RAMZi. Now label-founder Ian Wyatt releases on Mood Hut for the first time as Local Artist (he has, however, already got a MH drop under his belt from when he went by Slow Riffs). 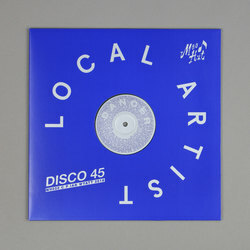 Both ‘Dancer’ and ‘Dreamer’ are fun, funky pieces of deep house that sport cracking basslines. You can see why Rhythm Section International and Proibito have tapped Local Artist in the past.